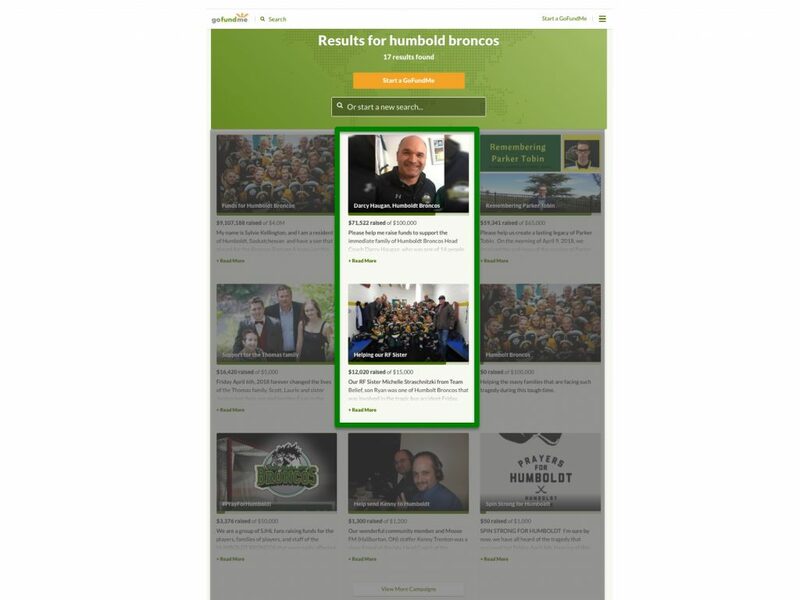 At least 17 different GoFundMe campaigns have been created to raise funds in the aftermath of the Humboldt Broncos bus crash. Apt613 spoke with two people behind lesser-known campaigns who share how they are connected to the families—and what they’ve learned about going online for help. When news first broke about the horrible collision that has since claimed 16 lives, injured 13, and left the entire country in mourning—social media feeds were quick to share multiple online fundraising campaigns, known as crowdfunding, that collect small amounts of money from large amounts of people. 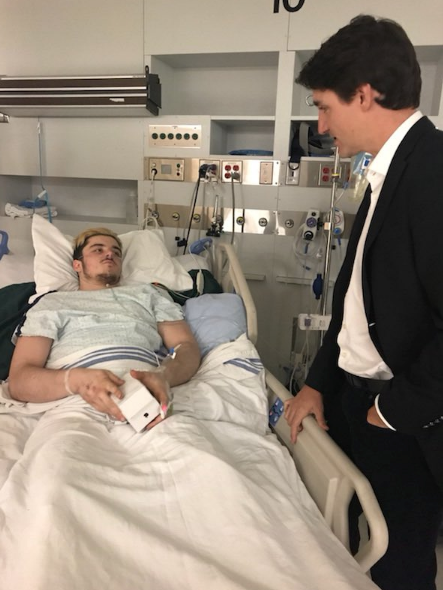 Major media attention has largely focused on the one campaign that’s raised more than $11 million dollars (now the largest GoFundMe campaign in Canada, and ranked top five for the most successful money-genearting campaigns on the platform) but there are more than a dozen others. “I just thought that we gotta do something to help,” says Stacey Shiner, 44, in reference to her colleague, Michelle Straschnitzki, whose 18-year-old son Ryan plays for the Humboldt Broncos and was severely injured in the incident. Shiner, a resident of Airdrie, Alberta, explains that she and Michelle work together with Rodan + Fields (noted as RF on her campaign description below), an e-commerce business that’s a tight-knit community. “Michelle posted something on Facebook; that Ryan had been in an accident,” Shiner recalls. “I knew it was catastrophic,” she pauses. With no prior crowdfunding experience, Shiner created a campaign on GoFundMe to help Michelle with immediate expenses and has raised more than $13,000 over the past week. 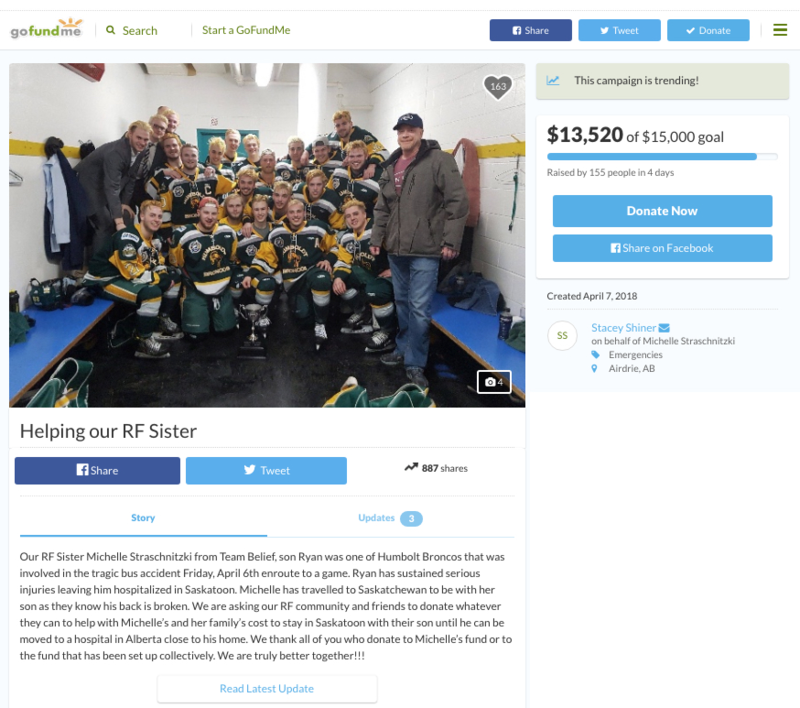 “[Michelle] has direct access to the funds and took her first deposit out this morning,” Shiner explains, adding that the Straschnitzki family will likely be flying back and forth with their other children between Alberta and Saskatchewan, where Ryan was studying at school. “Flights, the cost of eating out, hotels, transportation to and from the hotel… it’s the last thing in the world that we want them to worry about,” she says. As for using GoFundMe, Shiner admits that she had some technical issues early on but says that the overall experience has been “phenomenal” – largely due to the online support. “Oh, I don’t know. Maybe the [online] description,” she laughs as a short relief to an otherwise solemn interview. “I whipped [the campaign page] up real quick… I didn’t have time to proof-read it. I just wanted to get it out and to get the ball-rolling,” she says. “As soon as the dust settles, that’s when these families will really need help and support. I think it’s really important that we remember that,” she adds. 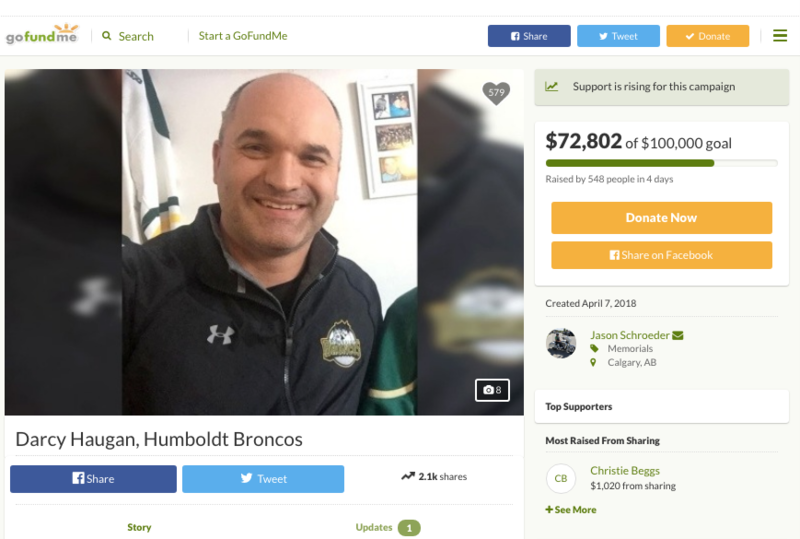 One of the other GoFundMe campaigns was created in support of Humboldt Broncos’ coach, Darcy Haugan. 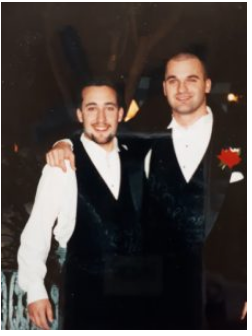 “Darcy and I were childhood friends from Peace River,” explains the campaign creator, Jason Schroeder, 42, via phone from Calgary, Alberta as he reflects on Haugan’s death. “Saturday morning [after the accident] I didn’t know what to do with myself,” he says. GoFundMe campaign creator Jason Schroeder and Darcy Haugan together at Jason’s wedding. Photo provided by Jason Schroeder. Schroeder notes that Darcy’s wife, Christina, is the beneficiary of the GoFundMe campaign but that he has yet to communicate with her. “You can set up the [GoFundMe] account with bare bones information,” says Schroeder, adding that he has 30 days to get the necessary details from Christina and prefers to remain on the periphery for the next few days and to give the immediate family space. Schroeder, also new to crowdfunding, says that the experience has surpassed his expectations in a variety of ways. “A lot of people include comments with their donations,” he says, noting more than 500 people have given to his campaign so far. He notes that Peace River will probably create a memorial and a new arena, currently under construction, might be named in honour of Haugan. “In the old days, people would just bring a casserole,” says Schroeder. When asked if he has any advice about crowdfunding, Schroeder takes a deep breath. “If it’s gonna be as big as this, it’s gonna take a ton of time,” he admits. “I do thank each donor individually,” he explains, adding that there’s an automatic response option that GoFundMe offers but he avoids it.